According to police, the slain researcher Dr Sabzar Ahmad Sofi—a resident of Nainan area in southern Anantnag district—had joined militancy soon after the killing of popular Hizbul Mujahideen commander Burhan Muzaffar Wani in 2016. Shergojri alias Khubaib—a resident of Khiram, Anantnag—had joined militancy in January this year, the police said. Talking to reporters soon after the gunfight ended, deputy inspector general of police (central Kashmir range), V K Birdhi, said that following a tip-off, the police and CRPF launched a cordon in Soothu-Kothair area in Nowgam. “We had a credible lead that militants are hiding in a house there. After the cordon, we zeroed in on the house. As the forces tried to go inside, the militants resorted to indiscriminate firing on forces, triggering an encounter,” he said, adding that in the ensuing gunfight, two militants were killed. A police source said that the cordon was launched at around 2 am. Asked whether the militants were desperate to enter Srinagar, he said: “The Fateh Kadal encounter where a top Lashkar-e-Toiba commander Mehrajudin Bangroo was killed is different from Nowgam one. Bangroo belonged to Srinagar and was operating in Srinagar only. Sabzar was killed on Srinagar outskirts but was operating in south Kashmir,” Khan said. Sabzar, according to his family, had done MSC in Botany from Barkatullah University Bhopal and M.Phil from Jivagee University Gwalior. He had left his home to pursue PhD but surfaced on a social networking site, wielding a gun, in 2016, a family source said. Sabzar Ahmad Sabzar, 31, son of Bashir Ahmad Sabzar — the militant who was killed along with his associate in a gunfight with troops at Nowgam area of Srinagar on Wednesday— is third highly educated militant to be killed in gunfight with forces this year. Sabzar’s family was sipping tea when news about him being trapped in an encounter in Nowgam was flashed on social media sites. 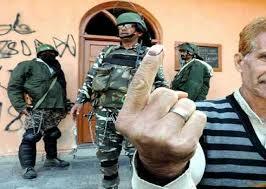 “We didn’t did believe he would be trapped in Nowgam. We thought how he could be there,” said a family member of Sabzar before breaking down. Sabzar, a resident of Naina village of south Kashmir Anantnag district was killed along with his associate in a fierce gunbattle with forces at Sothu Kothair area of Nowgam in outskirts of Srinagar on Wednesday. Sabzar’s family member said he had left his home on pretext of attending coaching classes for Indian Administrative Service (IAS) examination on July 8, 2016—the day poster boy of militancy and Hizbul Mujahedeen’s tech-savvy top commander Burhan Wani was killed. Sabzar was taking coaching for IAS at Initiative for Competition and Promotion (ICP) Nowgam Srinagar. “A month after joining the coaching, he told his family that he wanted to move to Delhi to avail better coaching there and simultaneously pursue PhD from Jamia Millia Islamia University,” he said. “We gladly permitted him to go to Delhi. He left home early morning of July 8 and in the evening Burhan was killed. But never had we seen an inclination in him of joining militancy,” the family member said. After doing graduation from Degree Dollege Anantnag in 2007, Sabzar pursued Masters of Science (MSc) in Botany from Barkatullah University in Bhopal, and then did his M Phil from the Jiwaji University Gwalior. He had also qualified National Eligibility Test (NET). He had also done his Bachelors in Education. Sabzar belonged to a well off family. His father Bashir Ahmad Sofi is a retired government employee and his three brothers and sister are also well educated. After Burhan’s killing, Sabzar’s family couldn’t establish contact with him as the mobile network was suspended across the Valley. The family was hopeful of Sabzar’s safety as they believed he was in Delhi. However, a month later when there was no communication from him, his family started searching for him. “While we were searching him, a police officer visited our home and wanted to know whereabouts of Sabzar. We told him that he was in Delhi. However, to our shock, the officer informed us that he had joined militancy,” Sabzar’s family member said. He said they then learnt that he had actually not gone to Delhi but joined militancy. Sabzar is the third highly educated militant to be killed in gunfight with forces this year. 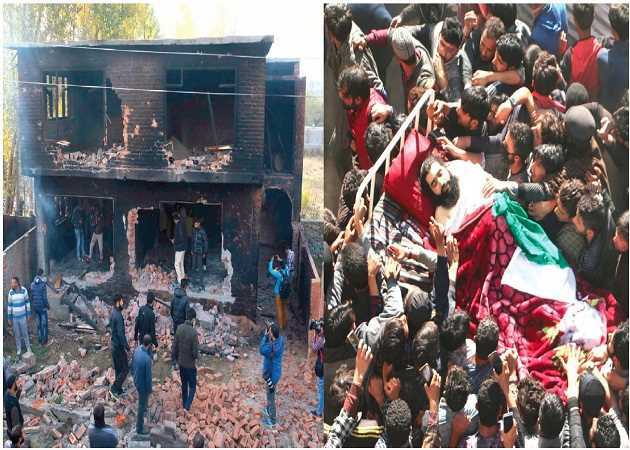 PhD-scholar-turned Hizb militant Manan Wani of Tekipora Kupwara and another PhD scholar and Kashmir University Assistant Professor Mohammad Rafi Bhat of Ganderbal district were killed respectively in October and May this year. The police said to avoid repeat of Kulgam-like incidents, a multi-layer cordon was kept intact even after the gunfight ended to ensure that the site is properly sanitised before forces leave the area. “We also erected banners displaying message: ‘don’t come closer, area being sanitised’. This was done to ensure that the encounter site is properly cleared of possible explosives,” the ADGP said. In Laroo village in southern Kulgam district on Sunday, six civilians died after rushing to the encounter site where an explosion took place. Another civilian was reportedly killed after being hit by a bullet during clashes in the district. Soon after the gunfight ended, scores of youth took to streets amid pro-freedom slogans in Nowgam, Naikbagh, Bonpora, Nowgam Chowk and resorted to intense stone pelting on the forces who were part of the cordon. A witness said that angry youth blocked roads with rocks and logs and engaged forces in pitched-battles throughout the day. “The forces responded with teargas and ‘pava’ shelling. 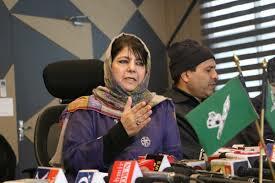 Several youth sustained minor injuries in the clashes,” the witness said. Residents of Nowgam, Pohru, Bonpora, Nowgam Chowk, Naik Bagh, Natipora, Channapora and other adjacent areas alleged that the police and CRPF personnel, while chasing the protestors, broke window panes of dozens of houses in these areas. 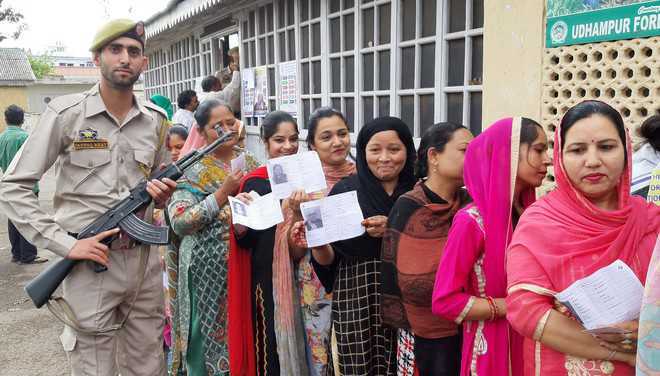 “The forces personnel also hurled abuses at people and damaged private vehicles parked on roadsides,” a group of women from Bonpora alleged. “He was involved in killing of one civilian lady namely Biba wife of Muhammad Yousuf Matto, a resident of Naina Batapora,” the police statement read. “Another militant was actively involved in attacks on security establishments and civilian atrocities in the area. He was involved in many militancy cases and prominent cases include FIR No. 04/2018 under section 13 ULAP Act registered at police station Srigufwara and FIR No. 15/2018 under section 15/2018 under section 451, 392,506 RPC, 7/25 Arms Act registered at police station Srigufwara,” the statement said.